Several studies worldwide have reported that acne has major effects on patients’ quality of life (QoL).4-12 Some studies have tackled the psychological effects of acne such as anxiety, depression, emotions, self-identity, self-esteem, and suicidal tendency.7,13 Others have addressed the impact of acne on QoL in comparison to other skin diseases and general medical conditions.6,12 Few studies have claimed that there is no significant association between the grades of acne severity and its impact on patients’ QoL.13,14 There have been a few published papers from the Arab Gulf states to explore this effect.11 Furthermore, there are no publications from Oman that have addressed this issue. Thus, the aim of this study was to assess the effects of acne on the patient’s QoL. Its secondary objective was to assess the influence of gender, and symptom severity on QoL. Table 1: Domain structure of the Acne Quality Of Life questionnaire. All questions were framed to be disease specific (‘... because of your facial acne’). This descriptive cross-sectional study was conducted in the Student Clinic at Sultan Qaboos University (SQU). The study examined the response of male and female students at SQU who were diagnosed with acne and attended the Student Clinic during a three-month period (1 September to 31 December 2009). The diagnosis of acne was confirmed by the family physicians working in the clinic. The study group included all acne patients aged between 17–27 years. Students who could not understand the questionnaire in English were excluded, as permission to translate the questionnaire into Arabic was not obtained. Doctors on duty at the clinic approached eligible students, and those who agreed to participate were asked to self-fill the Acne Quality Of Life index (Acne-QoL) questionnaire.15 The index is an internationally used tool, which has been validated in many places around the world, including Saudi Arabia.11,14 The study sample size was calculated for the population of SQU students with a confidence level of 95% to be 95. The Acne-QOL questionnaire contains 19 questions organized into four domains, which address the impact of facial acne on health-related quality of life as shown in Table 1. The advantage of the Acne-QOL questionnaire is that all questions were disease specific (“. . . because of your facial acne”) which meant that the QoL effect was unlikely to be due to other factors. Scoring of the Acne-QoL questionnaire was performed as follows: 1) Each response was coded, 2) Missing values were identified and any missing value was replaced with the mean of the given sub-score (score for questions under each domain) and, 3) An overall domain score was calculated by summing the coded responses to each question in the domain. Responses were numbered starting from 0 in ascending order (0=extremely, 1=very much, 2=quite a bit, 3= a good bit, 4=somewhat, 5=a little bit, 6=not at all). This coding scheme was adopted so that higher scores for each domain reflected increased health related QoL, that is less negative self-perception, social, emotional, and symptomatic effects associated with acne. However, if there were less than three questions answered in a given domain then the subscore was not calculated. Analysis of data was performed using SPSS (version 17) and the sub-scores for each QoL domain were calculated. Error bars were used to compare the impact of acne on the different domains. In addition, the effect of gender on the sub-scores of different scores was assessed. 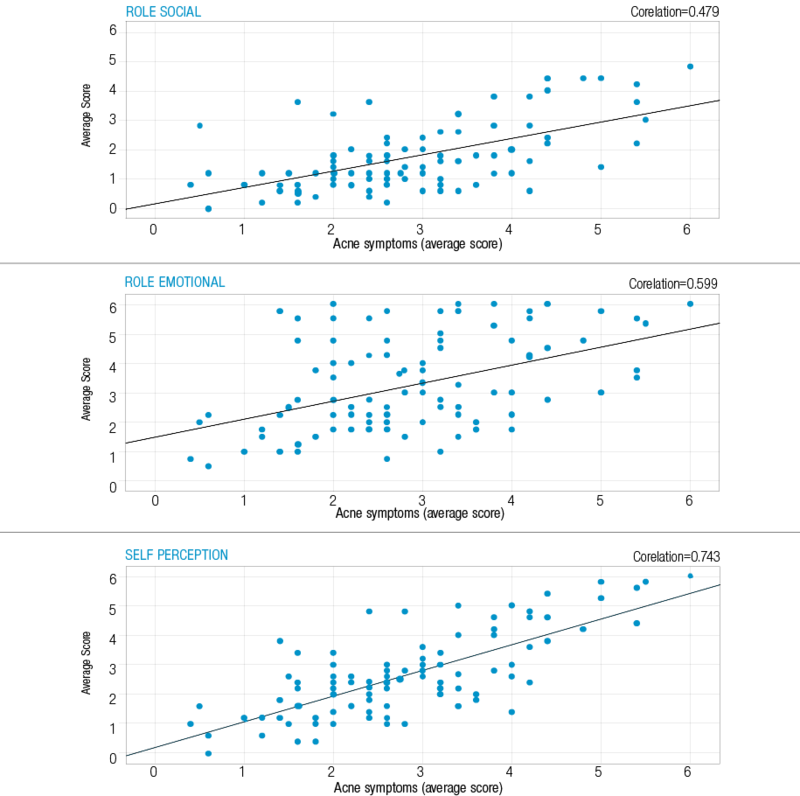 Furthermore, the correlation between acne symptom score (severity of acne) and the other three domains was assessed using Pearson correlation (R). Figure 1: Average scores for the four Acne Quality of Life domains. 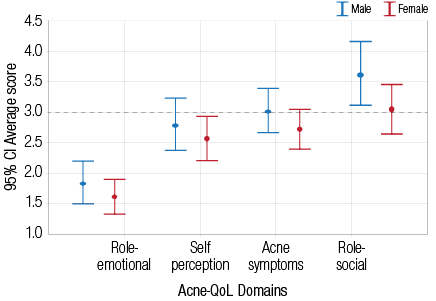 Figure 2: The relationship between gender and average scores in the four Acne Quality of Life domains. 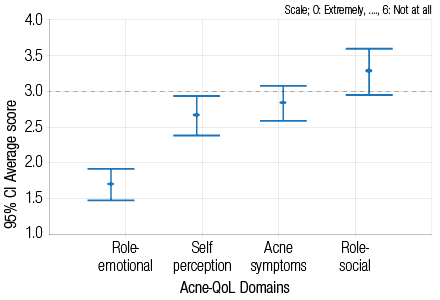 Figure 3: Impact of acne symptoms on the role-social, role-emotional and self-perception of quality of life. A total of 100 acne patients participated in the study. Of those, 40 were males and 60 were females. There were few missing values (<1) in each domain for every subject, and these values were substituted by the mean of the subscore as explained in the methods. Therefore, there were no missing values in the overall statistical analysis of the results. Figure 1 shows the average scores of cases in the four different Acne-QoL domains. The most negatively affected domain was role-emotional (mean score 1.7), followed by self-perception (mean score 2.6), and the least affected domain was role-social (mean score 3.4). Figure 2 shows the relationship between gender and the sub-scores for each of the four QoL domains. Though not statistically significant, female participants reported more adverse effects. The mean score for the self-perception domain was 2.5 for female students, and 2.8 for male students (p=0.300). The role-social domain approached a significant difference between the genders, the mean score was 3.6 for males and 3.0 for females (p=0.078). For the role-emotional domain the mean score was 1.8 for male and 2.5 for female students. Figure 3 shows the correlation between acne symptom sub-score and the other three Acne QoL domains. There was a statistically significant correlation between severity of acne symptoms and the other three domains (p<0.001 for all domains). The correlation was highest between acne symptoms score and self-perception score (R=0.74). Pearson’s correlation was 0.59 for the role-emotional domain, and 0.47 for the role-social domain. We sought to assess the impact of acne on the QoL of students at SQU as well as assess the influence of gender, and severity of symptoms. Our results agreed with previously published studies3-12 and emphasized that acne, often regarded as a simple disease, has a great impact on patients’ QoL. This information can be valuable for physicians and other health care professionals to better understand the psychosocial impact of this condition on patients’ lives. QoL was measured by four important domains: self-perception, role-social, role-emotional, and acne symptoms. A study conducted by Cresce et al,13 concluded that the health-related QoL impact of acne was similar to asthma, epilepsy, diabetes, back pain, arthritis, and coronary heart disease. Our study found that the effect of acne on the emotional aspect of QoL was worst when compared to the other three domains. This was because emotions are usually influenced by the physical appearance of the individual. Lasek and Chren2 reported similar findings, they used Skindex, (a validated tool to measure of the effects of skin diseases on patients’ QoL16) to determine the effect of acne on the QoL of 60 patients who were on follow-up with dermatology specialists. They found that the emotional aspect was the most negative in affected patients’ lives.2 Tasoula et al17 reported a significant impact of acne on patients’ emotions in terms of self-embarrassment, self-esteem, feelings of unworthiness, and disturbance due to acne symptoms such as pain and itching, and discomfort from treatment. The second most affected domain was self-perception, which measured the patients’ self-image. This finding can be explained since the acne affects mainly the face (and facial acne was assessed here), which plays a major role in the appearance of the person. This effect was evident in both genders; but female students were more negatively affected than males, as expected. The same results were seen in other studies.9,15,18-20 However, some studies have reported that acne was more severe and frequent in boys than in girls.9,18,20 In general, female students scored more negative results in all four domains than male students, although the difference was not significant. This difference is not surprising, as females are usually more concerned about their physical appearance. Similar findings were reported by Al Robaee et al,11 and others,14-25 who found that female patients were more concerned about their appearance and negatively affected by the presence of acne vulgaris. In addition, this study examined the correlation between the acne symptom domain (which represents the severity of acne) and the other three domains of the Acne-QoL index. We found a significant correlation between acne symptoms and all of the other domains. This was an expected finding, as any increase in acne severity would lead to an increase in the negative effects on the patients’ feelings, self-perception, and socialization as the lesions became more prominent and if scarring occurred. Few studies reported a significant relationship between the severity of acne and its effect on the patient’s QoL,6,21 most did not report any significant association.3,5,6,12,14 The reason for this difference is not clear, but most of these studies were carried out in a secondary care setting where most patients present with more severe forms of acne whereas this study was carried out in a primary care setting where all grades of acne are present. A second explanation could be the age of the patients, as most of the studies assessed secondary school students (a younger age group) who might have a less severe form of acne. This explanation is supported by the results of Tasoula et al,17 which showed that middle and late adolescents suffered a greater negative impact on their QoL because of acne. Therefore, family medicine and primary care physicians should take into account the effect of acne on patients’ QoL (irrespective of the severity of their acne) rather than just focus on individualizing treatment. The strengths of the study include that it was conducted on university students who are in early adulthood during which time acne vulgaris is most prevalent and when the effects of any health problem on the QoL would have greater effects on the patient’s future. Furthermore, the study used a self-administered questionnaire making it less likely for the candidates’ responses to be affected by the clinician’s opinion. There were some study limitations. The study participants were university students who are a small subgroup of the general population and were more homogenous in terms of age (the age group of our study was 17–25 years) and their educational level was almost equal, so the study sample may not represent the general Omani population. In addition, the demographics of the participants were not assessed in the study. However, this might not have significant effects as the scale used was disease specific (all the questions contained the statement “because of your facial acne”). Another limitation was that the questionnaire was in English and a significant number of students were excluded as they could not understand the questionnaire. This study showed that facial acne affects the quality of life of the affected students. Therefore, physicians and other health care professionals should address the psychosocial aspect while managing patients with acne. Since acne is a very common problem in the community, further studies using a larger sample size representing the general population are needed to address the extent of the problem among the acne sufferers. In order to increase participation, an Arabic version of the scale needs to be developed. Hanna S, Sharma J, Klotz J. Acne vulgaris: more than skin deep. Dermatol Online J 2003 Aug;9(3):8. Lasek RJ, Chren MM. Acne vulgaris and the quality of life of adult dermatology patients. Arch Dermatol 1998 Apr;134(4):454-458. Pawin H, Chivot M, Beylot C, Faure M, Poli F, Revuz J, et al. Living with acne. A study of adolescents’ personal experiences. Dermatology 2007;215(4):308-314. Mallon E, Newton JN, Klassen A, Stewart-Brown SL, Ryan TJ, Finlay AY. The quality of life in acne: a comparison with general medical conditions using generic questionnaires. Br J Dermatol 1999 Apr;140(4):672-676. Aktan S, Ozmen E, Sanli B. Anxiety, depression, and nature of acne vulgaris in adolescents. Int J Dermatol 2000 May;39(5):354-357. Klassen AF, Newton JN, Mallon E. Measuring quality of life in people referred for specialist care of acne: comparing generic and disease-specific measures. J Am Acad Dermatol 2000 Aug;43(2 Pt 1):229-233. Jones-Caballero M, Chren MM, Soler B, Pedrosa E, Peñas PF. Quality of life in mild to moderate acne: relationship to clinical severity and factors influencing change with treatment. J Eur Acad Dermatol Venereol 2007 Feb;21(2):219-226. Gupta MA, Johnson AM, Gupta AK. The development of an Acne Quality of Life scale: reliability, validity, and relation to subjective acne severity in mild to moderate acne vulgaris. Acta Derm Venereol 1998 Nov;78(6):451-456. Pearl A, Arroll B, Lello J, Birchall NM. The impact of acne: a study of adolescents’ attitudes, perception and knowledge. N Z Med J 1998 Jul;111(1070):269-271. Gupta MA, Gupta AK. Depression and suicidal ideation in dermatology patients with acne, alopecia areata, atopic dermatitis and psoriasis. Br J Dermatol 1998 Nov;139(5):846-850. Al Robaee AA. Prevalence, knowledge, beliefs and psychosocial impact of acne in University students in Central Saudi Arabia. Saudi Med J 2005 Dec;26(12):1958-1961. Ilgen E, Derya A. There is no correlation between acne severity and AQOLS/DLQI scores. J Dermatol 2005 Sep;32(9):705-710. Cresce ND, Davis SA, Huang WW, Feldman SR. The quality of life impact of acne and rosacea compared to other major medical conditions. J Drugs Dermatol 2014 Jun;13(6):692-697. Zaraa I, Belghith I, Ben Alaya N, Trojjet S, Mokni M, Ben Osman A. Severity of acne and its impact on quality of life. Skinmed 2013 May-Jun;11(3):148-153. Acne-Specific Quality of Life Questionnaire (Acne-QoL): Manual and Interpretation Guide. Whitehouse Station, NJ: Merck and Co., Inc; 1997. Chren MM. The Skindex Instruments to Measure the Effects of Skin Disease on Quality of Life. Dermatol Clin. Apr 2012;30(2):231–236. Tasoula E, Gregoriou S, Chalikias J, Lazarou D, Danopoulou I, Katsambas A, et al. The impact of acne vulgaris on quality of life and psychic health in young adolescents in Greece. Results of a population survey. An Bras Dermatol 2012 Nov-Dec;87(6):862-869. Rapp DA, Brenes GA, Feldman SR, Fleischer AB Jr, Graham GF, Dailey M, et al. Anger and acne: implications for quality of life, patient satisfaction and clinical care. Br J Dermatol 2004 Jul;151(1):183-189. Tahir CM, Ansari R. Beliefs, perceptions and expectations among acne patients. J Pak Assoc Dermatol 2012;22:98-104. Smithard A, Glazebrook C, Williams HC. Acne prevalence, knowledge about acne and psychological morbidity in mid-adolescence: a community-based study. Br J Dermatol 2001 Aug;145(2):274-279. Shahzad N, Nasir J, Ikram U, Asmaa-ul-Haque, Qadir A, Sohail MA. Frequency and psychosocial impact of acne on university and college students. J Coll Physicians Surg Pak 2011 Jul;21(7):442-443. Abdel-Hafez K, Mahran AM, Hofny ER, Mohammed KA, Darweesh AM, Aal AA. The impact of acne vulgaris on the quality of life and psychologic status in patients from upper Egypt. Int J Dermatol 2009 Mar;48(3):280-285. Dunn LK, O’Neill JL, Feldman SR. Acne in adolescents: quality of life, self-esteem, mood, and psychological disorders. Dermatol Online J 2011;17(1):1. Uslu G, Sendur N, Uslu M, Savk E, Karaman G, Eskin M. Acne: prevalence, perceptions and effects on psychological health among adolescents in Aydin, Turkey. J Eur Acad Dermatol Venereol 2008 Apr;22(4):462-469. Hanisah A, Omar K, Shah SA. Prevalence of acne and its impact on the quality of life in school-aged adolescents in Malaysia. J Prim Health Care 2009 Mar;1(1):20-25.